Mass timber construction is on the rise, with advocates saying it could revolutionize the building industry and be part of a climate change solution. But some are questioning whether the logging and manufacturing required to produce the new material outweigh any benefits. The possible prodigious climate benefits are what has many people taking mass timber seriously. 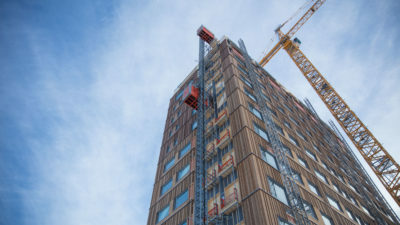 Author gaianicityPosted on April 13, 2019 Tags all weather application, Center for Sustainable Economy, climate impacts, concrete and steel, fully sustainable life cycle, mass timber, sequestering CO2Leave a comment on As Mass Timber Takes Off, How Green Is This New Building Material?